William Bernstein has an interesting stat on the really, really long-term returns of stocks, in his book Deep Risk. The second half of the twentieth century was extraordinarily kind to global investors, but the first was not. 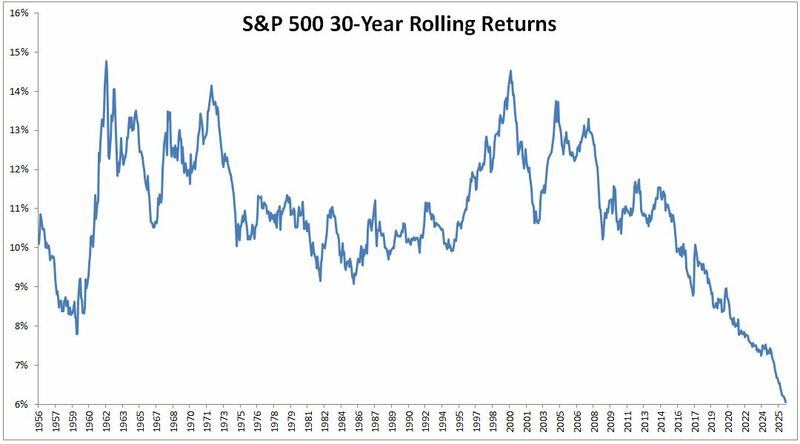 Brian Taylor of Global Financial Data Inc. notes that during the tragic half century between 1899 and 1949, a widely diversified global portfolio had a real return of just 2.81%, whereas over the sunnier 1949-1999 period it returned 8.53%. Over the next five decades, which of these scenarios seems more likely? Thinking over the intermediate-term, say the next ten years, you don’t have to look very hard to find people who expect low stock returns. The very simple and very reasonable thesis goes like this; In the early 1980s, interest rates were high and valuations were low. This combination left plenty of room for stocks to advance, and advance they did, growing at nearly 18% a year for the next twenty years. Unfortunately, we find ourselves today in the exact opposite situation. Valuations are high (although not nearly as expensive now as they were cheap then) and interest rates don’t have much space between where they currently are and zero. And given that stocks are up 260% from the bottom in 2009, it’s easy to understand why low expected returners feel this way (even though stocks are up just 66% from the 2007 highs). 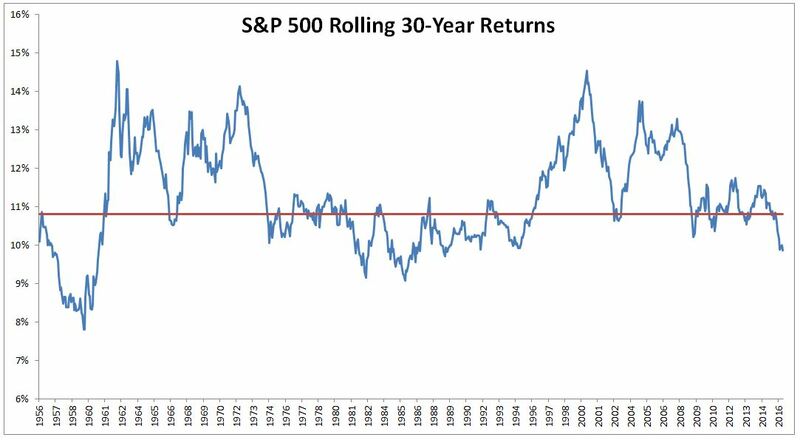 In the most recent long-term period (the last thirty years) the S&P 500 has had a good, but not great run. I guess two 50% crashes lead to below average returns ¯\_(ツ)_/¯. And if we were to see even lower returns for the next 10 years, say 2.5% nominal, the long-term returns from 1996-2026 wouldn’t look so hot. In fact, it would produce by far the worst thirty-year return in the one-hundred years from 1926-2026, even worse than had you started investing at the top in 1929. If this scenario were to play out, the S&P 500 will have grown at just over 6% a year (nominal) for thirty years. But even the worst thirty year period wouldn’t be such a tragedy; 6% for thirty years would produce a nearly 500% return. So how do I think about market returns? I try not to. Nobody, and I do mean nobody can predict the future. Not the returns from tomorrow, next week, next month or next year. I don’t know what the next five decades will bring, but as somebody who believes that stocks are the only game in town, and one who holds the majority of his portfolio in index funds, I have this sketch from Carl Richards hanging on my wall to remind myself of a few things. 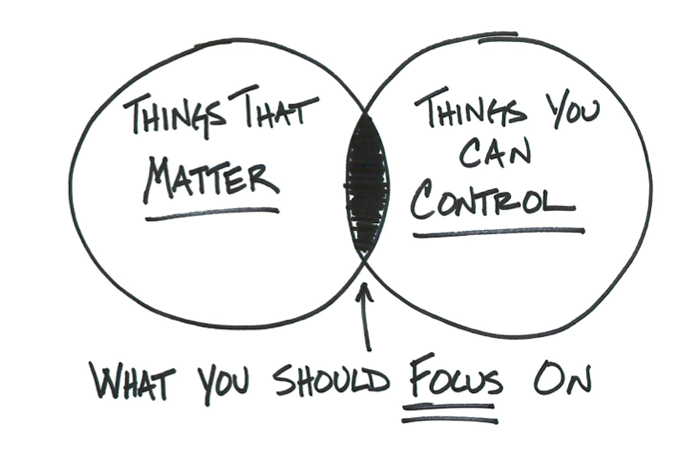 So with this in mind, here is my list of things that matter, things you can control, and the things you should focus on. Not letting a long-term plan be derailed by the current market environment.